A smartphone app designed to promote proper child car seat use among parents proved effective in a study led by researchers at Johns Hopkins Bloomberg School of Public Health. The Bloomberg School researchers and their colleagues developed the interactive app, Safety in Seconds v2.0, and tested it in a randomized, controlled trial involving more than 700 participants. Participants reported significant improvements in several child car seat practices, such as having the correct car seat or restraint for the child's age and weight, and having the car seat inspected by a child passenger safety technician. These results held up at three and six months after participating parents used the app. "With an app like this we can reach a large number of people with messages that are tailored for each individual, and this study shows that approach has been quite effective in increasing child passenger safety," says lead author Andrea C. Gielen, ScD, professor and director of the Johns Hopkins Center for Injury Research and Policy at the Bloomberg School. Despite major improvements in safety measures over the past few decades, motor vehicle crashes continue to be the leading cause of death for young children, and parents still frequently choose the wrong type of car seat or seat restraint for their children. The National Highway Traffic Safety Administration has estimated, for example, that only about 46 percent of children ages four to seven are placed in the proper booster car seats and 24 percent use a seatbelt prematurely. The Safety in Seconds v2.0 app works on both iPhones and Android phones. It asks each participant a series of questions about his or her practices and beliefs concerning child car seats and, based on that information, delivers appropriate safety tips in a personalized way, using the names of the participant's children and referring to relevant child car seat laws in the participant's state. The app provides a link to an online "parent portal" with additional safety education and can send reminder messages about child car seat safety as the child grows. Gielen and colleagues recruited a total of 742 parents of children between four and seven to the study in the emergency rooms of the Johns Hopkins Children's Center and the Arkansas Children's Hospital, with senior author and pediatrician Mary Aitken. Each participant was randomly assigned to an intervention group, which received the Safety in Seconds v2.0 app, or a control group, which received a similarly structured app about fire safety. In the study, the team examined four behaviors reported by participants at enrollment and after three and six months: having the correct car seat or restraint for the child's age and weight; having the child ride in the back seat always; buckling up the child all the time; and having the car seat inspected by a certified child passenger safety technician, often accessible via a local fire department or children's hospital. 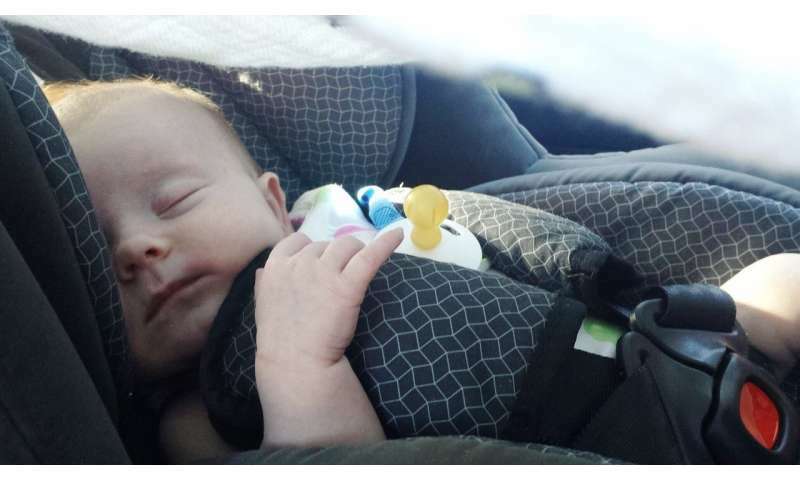 At three months, the group receiving the Safety in Seconds v2.0 app reported large and statistically significant increases in the rates of three of these four behaviors—the exception was having the child's seatbelt buckled, for which the rates were very high at the start and thus had little room to rise. For each of the three behaviors with significant reported increases, the increase was roughly double that seen in the control group. At six months, there remained significant improvements in the intervention group relative to the control group for two of the behaviors: having the correct car seat and having it inspected. The team is now following up with a larger-scale, foundation-sponsored trial of the app in four states. They are also exploring ways to distribute the app to parents, possibly via pediatricians' offices or even Apple's App Store or Google's Play Store. More information: "Results of an RCT in Two Pediatric Emergency Departments to Evaluate the Efficacy of an m-Health Educational App on Car Seat Use" American Journal of Preventive Medicine (2018).